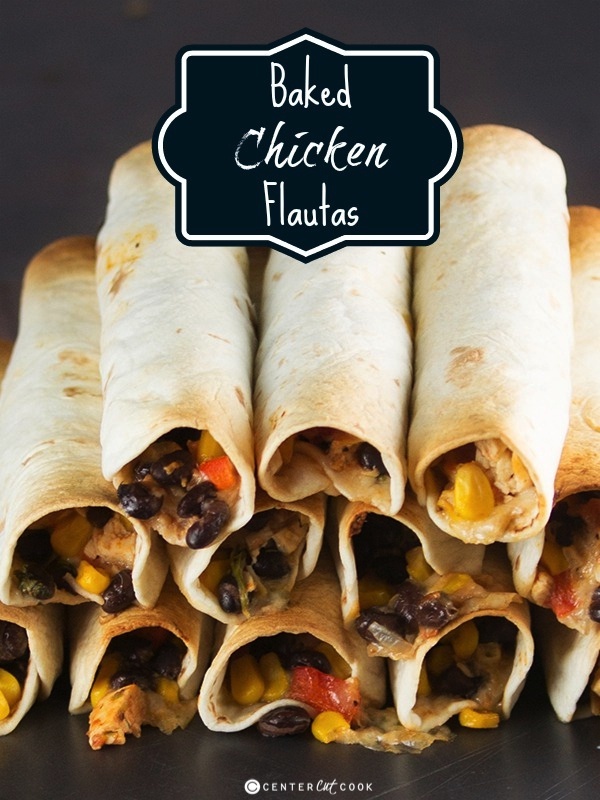 Crispy Baked Chicken Flautas with flour or corn tortillas, stuffed with chicken and cheese filling! Perfect as an appetizer or a main dish! I am an absolute sucker when it comes to Mexican food. 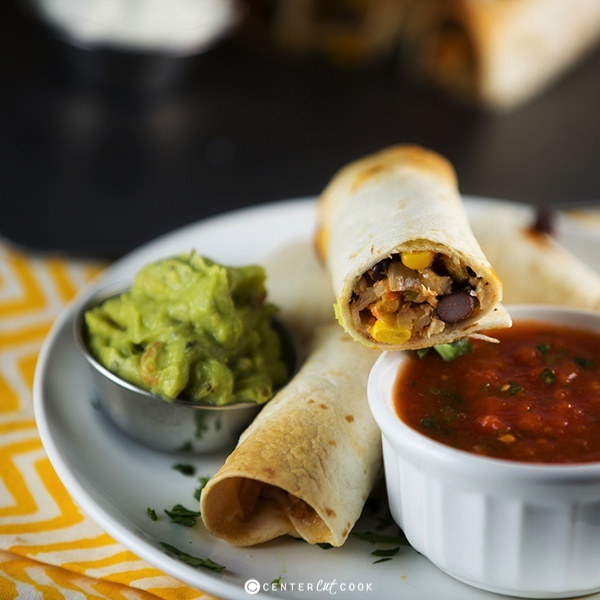 You name it, I love it whether it’s Cheesy Baked Oven Tacos, Skinny Creamy Taquitos, Steak Quesadillas, or my new favorite, these Crispy Baked Chicken Flautas stuffed with chicken and cheese filling! As I was preparing this recipe, I was trying to determine the difference between a taquito and a flauta when I learned something new. Flautas are typically made with flour tortillas while taquitos are typically made with corn tortillas which technically means I named these Skinny Creamy Taquitos wrong. Oops! Regardless of whether you call it a flauta or a taquito, all you need to know is that this crispy baked chicken flautas recipe is awesome! And because they are baked and not fried, you can feel a little less guilty eating them. The chicken and cheese filling comes together pretty quickly and consists of pretty basic items. I used shredded rotisserie chicken from the grocery store for a short-cut, and included things like black beans, diced red bell pepper, corn, salsa, and for creaminess, a little sour cream. And of course there’s cheese, because I like things cheesy! I used monterrey jack cheese but you could use cheddar, colby jack, or whatever you have on hand. Once the filling is made, you will place a heaping 1/4 of filling on each tortilla, roll it up tightly, and bake them until crispy and golden brown! 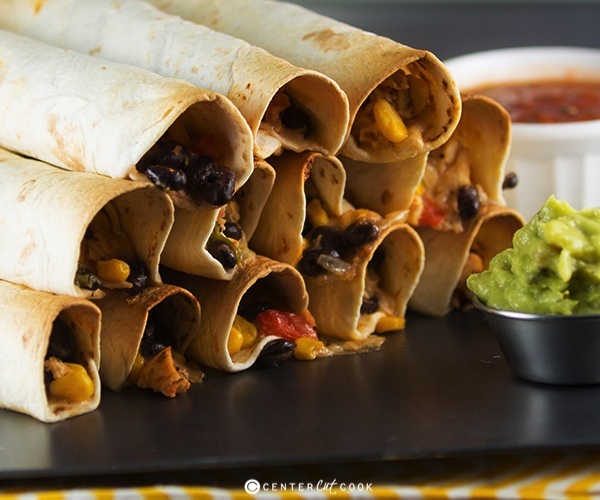 I like to serve these Baked Chicken Flautas with my favorite classic salsa recipe on the side, The Best Guacamole, and a little sour cream. Pre-heat your oven to 425 degrees and line a large rimmed baking sheet with parchment paper. In a large skillet, heat 1/2 tablespoon olive oil over medium high heat. Add in diced red pepper and yellow onion and sauté until tender, about 5 minutes. Season with a bit of salt and black pepper. In a large bowl combine chicken, salsa, sour cream, cheese, black beans, corn and pepper/onion mixture. Spoon a heaping 1/4 cup of filling on each tortilla and roll it up tightly. Place seam side down on the prepared baking sheet. Repeat until all of the filling is gone. To make the flautas extra crispy, spray the tops of them with non-stick cooking spray. If you don’t spray them, they’ll still crisp up, just not as evenly. Bake for 15-20 minutes or until they are nice and crispy. Serve with guacamole, salsa, and sour cream on the side.